Wheeling Gaunt is remembered each year when the Village of Yellow Springs distributes flour and sugar to its deserving widows, and has been for the last 123 years. But there is much more to Wheeling Gaunt’s story. Born a Kentucky slave, he earned his freedom by peddling apples and blacking boots. He freed his family and built a small real estate fortune. In 1864, with the Civil War closing in, he sold his holdings and moved to Ohio where he grew his fortune and his reputation for industry, frugality, fair dealing, and benevolence. 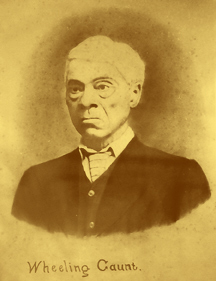 He was known to every distinguished man of his race from Frederick Douglas to AME Bishop Daniel Payne, founder of Wilberforce College. At his death, he was said to be the richest black man in Ohio. He bequeathed his considerable fortune to Wilberforce. Mr. Wheeling Gaunt was buried Sabbath afternoon in Glen Forrest cemetery. He was one of the best citizens of our village and will leave a record and example of his fair dealing and benevolence which would be well to imitate by those who are left behind. Stay informed or join the project’s supporters by liking Yellow Springs Arts Council on Facebook or signing up for their newsletter here. Brian Maughan (MFA, BFA from the San Francisco Art Institute) is a nationally known sculptor who moved to Yellow Springs in 2006 from New York City. 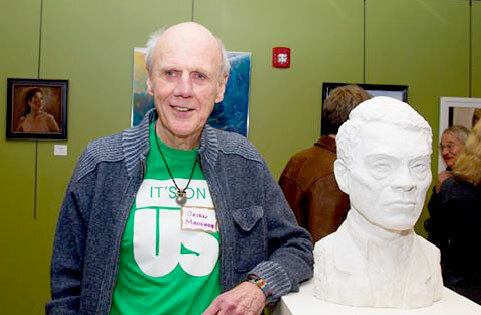 Maughan has worked in various media, but sculpture has dominated his efforts. In the last 20 years he has worked principally in ceramic clay, much of which is then cast in bronze. Recent installations include “Bob Uecker,” radio announcer, and “Bud Selig,” Commissioner of Major League Baseball, in Miller Park, Milwaukee. Originally from Yellow Springs, Cheryl Durgans is a visual artist, writer, and Wilberforce University instructor. She has managed numerous community arts programs, including the City of Philadelphia’s Mural Arts Program (2007-11), Porch Light Initiative, and the Love Letter mural, funded by the Pew Exhibitions Initiative. She received an M.F.A. in Studio Art from Moore College of Art and Design, following a B.A. in Art with a painting concentration from Spellman College. She has participated in the Philadelphia Fringe Festival, and Philadelphia Black Women’s Art Festival as both artist and writer. John Fleming, PhD, is current Director in Residence of the planned National Museum of African American Music in Nashville. A Yellow Springs resident, Fleming has worked for more than 30 years in the museum field, working diligently to bring the rich history of African Americans to diverse audiences in Ohio and across the country. President George W. Bush named him to the National Museum of African American History and Culture Presidential Commission. Other past affiliations include Ohio Historical Society’s Founding Director and Project Director for the National Afro-American Museum and Cultural Center in Wilberforce (1980-88); Director of the National Underground Railroad Freedom Center (1998); Vice President of Museums at Cincinnati Museum Center; Executive Producer of “America I Am: African American Imprint on America” traveling exhibition; Consulting Director of the International African American Museum Project in Charleston; Senior consultant for the Mississippi Civil Rights Museum. The Wheeling Gaunt Sculpture Project is made possible in part by state tax dollars allocated by the Ohio Legislature to the Ohio Arts Council (OAC). The OAC is a state agency that funds and supports quality arts experiences to strengthen Ohio communities culturally, educationally, and economically. Please consider supporting the Gaunt Bronze Sculpture Project – our fundraising goal is $169,000 (Phase 1 and 2 combined), so any amount will help!